The Lily Pad is available for 2019! Please email or call owner before using the book online feature. The Lily Pad (see website rent the lily pad dott commmm for photos and video) is a beautiful lakefront home on Horseshoe Bend in Lake Ozark (8 Mile Marker by water). You will enjoy a panoramic view of the lake the minute you walk through the front entrance. With its great view, nice cove setting, and comfortable furnishings, this home can sleep up to 14 people, but it is also a perfect setting for a smaller group of friends and family to make memories that will last a lifetime. The living room is large and open with plenty of comfortable seating. Sit and read, watch TV or a movie on the DVD player, or simply enjoy the view of the lake. Enjoy a drink at the wet bar or grab a game or a deck of cards to enjoy some time with friends. The kitchen opens nicely to the dining room area and has a breakfast bar and two tables for dining which creates seating for up to 12. The kitchen is fully equipped and has a laundry room with full-sized washer and dryer. Home is also equipped with high speed internet. The deck is roomy and has a gas BBQ waiting for those juicy steaks, burgers or chicken. Take a few steps down to the gently sloping lot and stroll down to the private, two well, covered dock. One slip is 10x28 and the other is 10x24 (note: the boat lift has been removed so both slips are now available for guest use). There is plenty of room on the swim platform for relaxing and taking in the sun. The Lily Pad is within hopping (i.e. walking) distance to The Horny Toad Complex/Camden on the Lake and Shady Gators -- the well known 7-mile cove restaurants & nightlife. It is close to golf (Season's Ridge), other restaurants (Ruthie D's, Lil Rizzo's, Blue Heron to name a few), fun attractions, and shopping. There is parking for up to 8 cars (or room for trailers). Additional parking is available closer to the road. We have been so fortunate to find several great families who choose The Lily Pad year after year for their family vacation. it is not uncommon to have 3-generations of a family book the home for a great family vacation at the lake. The Lily Pad is a place where the entire family can gather for a great, memorable vacation. We are blessed to have so many repeat guests!!!! Other times our guests include a group of great friends who meet at The Lily Pad for boating or golf vacations. We are also fortunate to have several groups like this who tend to come back to The Lily Pad year after year. We truly appreciate that loyalty and have enjoyed having these great groups of friends at The Lily Pad so many times! We hope all of you love the home as much as we do. Please see our website link in this listing for more photos and some video of the home, the dock, the lake, etc. Do not hesitate to email or call for more information or with specific questions. We hope The Lily Pad becomes your annual destination at the lake! We love every minute we get to spend at the lake. However, at this stage in our lives we cannot be there enough to justify owning the home, so we enjoy making it available to other families for their vacations. We very much appreciate the great feedback we get from families who vacation at our home. Your photos and kind notes make the sharing of our home so rewarding. When looking for our ideal lake property, several things were important to us. We really wanted a home that offered a great lake view from the moment you walk through the front door. However, these big views usually come from homes located on the main channel and we did not want rough water. We found you often sacrificed the nice view to get teh smooth water -- we wanted both! it was important to us to have a dock in smoother water, a place where you could hang out in the water, swimming off the dock, without the rough water that comes with a main channel location. Finding that big lake view, yet being located in a cove with smooth water at the dock was actually not easy. The Lily Pad offered us that perfect combination. You can have so much fun in the water and never even leave the big, beautiful cove! We also wanted a place where there was something for everyone to do. Some people enjoy hanging out at the dock, swimming and taking in some sun. Others enjoy getting out on the boat and exploring more of the lake, while some may prefer to sit on the dock and take in the views. Other friends or family may take the car and head into town for some shopping. Yet others may like a little night life, but prefer not to drive as they go out for an evening -- so we wanted a couple of fun places to be within walking distance, but just not too close! The Lily Pad location was perfect for all of these desires. Everyone finds their 'niche' at The Lily Pad. Finally, a great location by water was also important to us. We enjoy the water by day, but we truly love the water at night. The Lily Pad gave us that perfect location where so many great restaurants were just a quick boat ride away. A night on the water at Lake of the Ozarks is just something we truly treasure. A relaxing cruise under the stars, dinner at a lakeside restaurant, ending up back at the dock at The Lily Pad is the perfect evening for us. We hope you agree! For several reasons our home seems to attract groups of guests that cross generations. While some in your group want to enjoy a quiet night grilling steaks and enjoying a nice beverage on the dock overlooking the lake, others in your group may want to venture out. We are walking distance to a couple of restaurants/lake bars so those that want to get out can do so by foot. Master bath has dual sinks and separate tub and shower. 2nd full bath has access from hall or also private access from 2 other bedrooms -- Jack and Jill style. There is also a 1/2 bath on the kitchen, living room level. Great views of a huge, beautiful cove at Lake of the Ozarks. 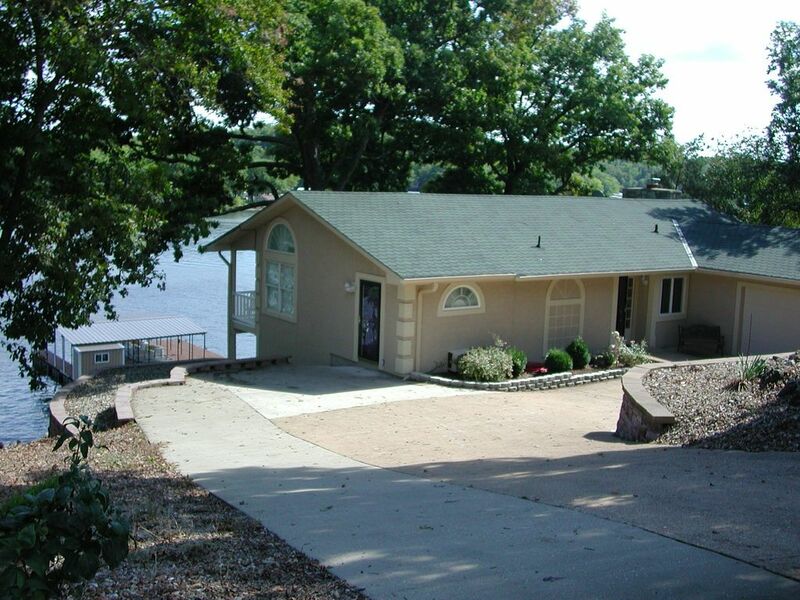 Enjoy this wonderful lakeside home with private boat dock with your family and friends. Located on a huge, beautiful cove at the 8 mile marker by water. TV in family room, master suite, and one other bedroom. There is a TV in the kid's room also but it is for DVDs or games. 3 DVD players. TV/DVD in kids room is for DVD's or games only. Bring your games if you want them! Feel free to trade with our library. Screened in upper level balcony off the master suite. Enjoy great views of the lake while having dinner on the deck. We had a wonderful time at this rental. The location is excellent and the house had everything you need. We were a group of 9 and had plenty of room. Being in the cove allowed our kids to do plenty of swimming off the pier. We will definitely rent again from this owner. Really enjoyed our stay at this home! I had never rented a vacation home before so I was anxious. However, it was perfect. The bedrooms worked out great for our large family. We enjoyed being outside on the deck and on the dock. The cove was perfect, not too busy so the teenagers could jet ski and tube without being out on the main part of the lake. Very near gas stops on the water for the boat just across the cove or around the pier at Shady Gators. Only a 15-30 minute drive to the outlet mall, laser tag, mini golf, go carts and other popular restaurants and ice cream depending on where you choose to go. However, you don't even need to leave the house if you do not want to. Bring your rafts, some fishing poles, etc. and you will have a great time. In just a few short sentences, you explained our home and location perfectly. To Stacy.... thank you for the great review and for so succinctly explaining what The Lily Pad (that's what we call our lake home so Google The Lily Pad Lake of the Ozarks) offers our guests. To potential guests.... if that sounds like the vacation you are seeking, we look forward to talking to you. Family vacation was a hit! My siblings and I rent a place on Lake Ozarks annually with our extended families. First off, the owner is very professional and candid in communication. The house is a great value for what you get. Ideally located close to some affordable restaurants on and off the lake. Very well kept property and dock. Ideal for families with ages 8-15, There is an additonal room off master room which has bunk beds/ and extra beds. This works best for kids in this age group. it you are looking at cooking a large Meal, may need to bring a large pot with you. Home is very nicely equipped, but you may want a large pot of planning to cook a large meal. If you aren't familiar with the Ozarks and traveling for first time, particulary with kids, it's a great cove. Never underestimate the importance of a nice, party free cove when kids are on the water. I highly recommend this property for families and "mature" adults. Can't wait to work with them again. Rented this house for Memorial Day weekend and had a wonderful experience. Wonderful dock to lay out and swim off of, plenty of space and kitchen amenities inside, and truly within walking distance to several popular bars on Osage. I wouldn't look at any other properties if I were planning another trip to the lake, highly recommended! We stayed at the Lily Pad with our daughter and her family for a long September weekend. It was a perfect get-away for us to spend time together. The house is everything it says on VRBO and more. It was spacious, well decorated, clean, great views, and a short walk to the dock where you can dock your own boat. It's also a great location on the lake, a cove off the main channel and a great location for restaurants and any other shopping or tourist attractions you might be looking for. We enjoyed sitting on the large deck and cooking on the grill. In September the lake was fairly quiet so we had great boating, tubing and swimming right off the dock. The best part of renting the Lily Pad was the super service and communication with the owner. I've rented very many vacation homes in the past and would say that working with Mike was one of the best experiences I've had. He always responded quickly to my questions, sent a lot of additional information that made our stay easier and was just fun to communicate with. I feel like I've known him a long time even though we've never met. Our grandkids are asking "when are we going back" so that's a good indication that they had a great time too. Thanks, Mike, for everything. Thank you for the kind words. It also takes great guests for the experience to be so good, and we are blessed by great guests at The Lily Pad every summer. Carol, we know this was your family's first visit to The Lily Pad, but we hope you join our other great families who make it an annual trip. You were a pleasure to work with, and we hope you feel like you have found "your" lake house. We also enjoyed your pictures. When we cannot be there, we love seeing other families enjoy our home so thank you for sharing those. We hope to hear from you again! Thank you again for taking time to write a review. We enjoyed staying at the Lily Pad. It was so nice. Right on the Lake so we rented a pontoon for 11. Nice bedrooms and plenty of room to bustle around without feeling like you bumping into everyone. Very nice views from the deck and house. The owners were so accommodating and easy to work with. Enjoy every minute. We would definitely stay here again. The Lily Pad is within hopping (i.e. walking) distance to The Horny Toad Complex and Shady Gators -- the well known 7-mile cove restaurants & nightlife. It is close to golf (Season's Ridge), other restaurants (Ruthie D's, Blue Heron), fun attractions, and shopping. There is parking for up to 8 cars (or room for trailers), and there is also a 2 car garage. Additional parking is available closer to the road. We hope you love the home as much as we do. Please note from June 15th through August 15th there is a 5-night minimum. Cleaning fee is $235 per stay -- thank you for helping us keep this cost down. Call owner to see if any discounts are available for your preferred dates. We are happy to help. We really recommend that our guests call to speak with the owner. We are happy to answer any questions and are happy to help you plan your vacation. We want to make this easy! Let's talk and see if our home is a fit for you.